While researching for this website I tried to trace the fate of the six Isle of Wight ships which took part in the Dunkirk evacuation. I reached the conclusion that, sadly, they had all been scrapped. Thus it was very good news to hear from a vistor to this site that one of the ships, the MFH has survived and is going to take part in the 2015, 75th anniversary re-enactment of Operation Dynamo. She will join other veterans in ceremonies taking place at Dunkirk to celebrate this historic event. Like several other ships in the Medina fleet, the vessel had a name related to fox hunting, for example the “Hound”, and the “Tantivy”. MFH stands for, “Master of Fox Hounds”. However, the ship voyaging to Dunkirk will not be called the MFH, for she was re-named by her present owner to “Gainsborough Trader”. 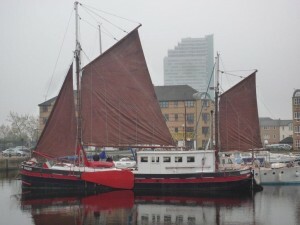 She has been beautifully restored and is now berthed in Greenland Dock, Rotherhithe, London.